The field was pretty even over the butterfly leg, but Emily Overholt of UBC Dolphins had the advantage heading into the backstroke. Maya DiRado of Stanford Swimming moved into the lead by the turn of the backstroke, but Bluefish Swim Club’s Elizabeth Beisel had moved nearly even by the back-to-breast wall. DiRado and Beisel turned together at the 250 wall. They turned exactly together into the freestyle, while Caitlin Leverenz of California Aquatics moved into third place just behind them. DiRado had a .1 lead at the last turn, and the battle continued down the final stretch. At the end it was DiRado with 4:36.85 to Beisel’s 4:37.01. 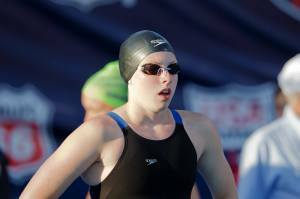 Sarah Henry of Aggie Swim Club touched third in 4:40.01. With that win DiRado sweeps the individual medleys, having won the 200 IM yesterday.Lindsey Clary of Ohio State edged Matea Samardzic of Croatia in the consolation, 4:45.50 to 4:45.91. Well done Liz! Good to see her back feeling good.